Every dentist deals with emergencies on a regular basis. Some of them involve pain and infection and can affect your general health. Others may have no pain or swelling but may affect psychological health, such as when a front tooth breaks or is missing. Regardless of pain, this is a true dental emergency for most patients and that is what I want to focus on in this blog. When a front tooth breaks, I usually hear from the patient right away. We try to accommodate them as soon as possible because I understand that psychologically, almost no one wants to go around with a broken front tooth. People feel especially attached to their anterior teeth because it is part of their smile. When it is changed in a negative way, it erodes their confidence. There are studies on the psychology of the smile and how a bad smile will create anxiety and cause people to avoid social events. 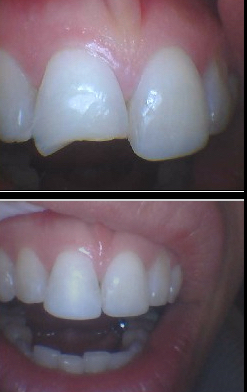 A broken front tooth can amplify this affect further because it can create a sudden dramatic change in appearance. This may seem obvious to most people and certainly to dentists but over the years the extent of the anxiety this creates has surprised me. People are very self-conscious when something happens to one of their front teeth. I completely understand and would feel the same way. When my sister was 8 years old, she fell and broke her front upper tooth. It was fixed but when she was a teenager she was in an accident and the tooth got knocked out completely. It was placed back in her mouth and lasted for some years but when she was in her late 20’s it started to loosen and the root resorbed. This was while she was living in another country and she was worried the tooth could fall out at any time. 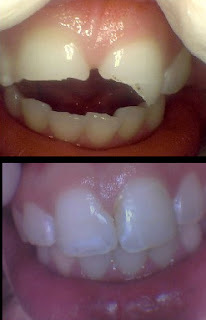 She was told the tooth needed to come out and she had a dental implant placed, which is still there after many years. However, while waiting for the implant to integrate into the bone and be restored, she had a gap where the tooth was and she needed to wear a flipper (a removable retainer with a fake tooth on it) for a period of a year. It worked out okay but created anxiety for her and other patients have told me this as well. My sister was traveling a lot and always worried that the flipper might break or that she would misplace it. My sister as well as other patients of mine have told me that when a front tooth is lost or about to be lost that it is not uncommon to have dreams about it. The good news is that we can almost always do some kind of a repair or fix, even if it is temporary. If a crown comes off, we can usually recement it, at least temporarily. If a tooth breaks, we can bond something on to restore it. If a denture tooth breaks, it can be repaired. If a tooth is beyond repair and needs to be removed, we can try to bond a fake tooth to the adjacent teeth. 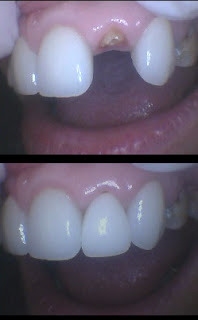 If this is not possible we can take an impression and make a retainer to fill the space with a fake tooth. This may take a day or so but we would always prioritize this type of treatment. Taking care of a front tooth emergency is one of the most rewarding parts of dentistry. Is there any advantage to missing a front tooth? I can think of one. I once had a patient in the practice I worked in years ago in San Francisco who was a chess master involved in both online chess games as well as tournaments around the world. Just before a trip to play in a tournament, he broke a tooth. It was just behind his anterior teeth and was very visible when smiling. The tooth was fractured and needed to be removed. He elected not to have it replaced before his trip. I think he felt he didn’t have time and was going to look at treatment options in Eastern Europe, where he was going to play in the tournament. When he came home and I saw him months later, he still had not had it replaced. I talked to him about it. Chess is a game that is of course all skill and no luck. But players do try and get a psychological edge over their opponent. He was a big guy and when he smiled and showed his missing tooth, it gave him a fierce look, perhaps intimidating his opponent. The missing tooth might have helped him win the match! I always enjoy and appreciate your blogs. Having just had oral surgery 4 days ago for 2 implants for my front teeth, I find this article very timely. You are so right and I am amazed to find out that others have had dreams as I have had dreams about losing my flipper or forgetting to put it in. I will feel an enormous relief when I finally can get a permanent bridge attached to the implants. The flipper has been fine and no one can tell I am wearing one, but I hate it. Maybe the dreams will stop then? Thank you for sharing. Everything you wrote here was so right on. I am so glad to have such an empathetic dentist!